Haresfied ridge was great this pm, a touch of west in it but strong lift. Two visitors from Solihul, whom I've seen there before. South Cotswold Soaring Association, we are holding our club thermal competition on Minchinhampton Sunday 23rd, 9.30 for a 10.00AM start. Sorry Phil, but I will be racing my mini at Croft in North Yorkshire! Sorry but I won't be around to help either as we have the in-laws and grand in-laws staying with us which I'm sure will be fun? ?!! Would much rather be up on the common. Hope the weather is good for it. Gonna try and get out for a sesh at some point tomorrow (Friday). looking promising at the mo. Just out of interest, does the wind ever blow from the NW around here? I'm itching to fly from Selsley but as yet, after a month at least, I'm still waiting for the chance. I presume Selsley has the best LZ for larger models in the area (once you've avoided the on-lookers and cows). Selsley has the two slopes. The West bowl which won't take any SW as the lift breaks up over the trees to the left. It will handle some North until the wind moves to the N-NW on the 'Tump' as we call it! We get plenty on NW over the winter but not much recently. We sometimes fly the ridge in between. Yes, the landing is perfect but we do watch out for gawkers / walkers / Paragliders and occasionally full size sailplanes, as they sometimes beat up the ridge. Haresfield looking ok for tomorrow. Have the in-laws around at the mo so don't reckon i'll be able to get there much before midday. Hopefully still catch a couple of you there. Out of interest, is there a particular wind speed or direction that creates the greatest rotor at the slope? Stronger wind equals stronger rotor at Haresfield. It's not too bad up to 10 mph or so. The important thing is to walk back to the top of the ridge for landing so you can see where the plane is if lands over the crest of the ridge. I flew my Prodij there earlier this week in 15-20 mph and landed without too much difficulty. I have a christening party this p.m. The club should be out in force on the slope next Sunday weather permitting. The rotor wasn't a problem but the variable lift was. So much so, that I just couldn't be confident enough that draggy mouldies I have would make it back to the ridge, and being a newbie to the slope, I didn't fancy landing out. Still had a top time there. Nice to meet you Oldnslow. Thanks for the help with the Hawthorn tree!! Frocester looks good this pm! I'll be out, with Phil and Andrew. Indeed! Managed to fly all three of my planes. First time the Luna has been out since doing a little open heart surgery on its elevator linkage. Mind you, I landed it a little way down the slope, and it disappeared among the foliage. It's at times like this that a lost model alarm would come in handy! Those trees just reach out and grab anything within 10feet, flippin' quick too. This is a photo from Tuesday of Gordon's VoltiJ flying at Frocester. Gutted to have missed seeing the Herc fly. Looks great in the photos. Back down in Cornwall loving the clean lift from the cliffs again. Hope you all have a great weekends flying. With the wind apparently coming SW, would it be best to fly from Haresfield or Frocester? I'm going to get a little lunch time flying in but don't know which slope would be best as the wind direction is right between the two according to the SCSA compass. SW is Frocester. Only go to Haresfield if it's SSW- SSE, but XCWeather currently shows SSW for Staverton! Will check it again before I leave. Thanks for the info. The small bowl at Haresfield will fly SW, just. Frocester fly SSW but it gets bumpy above a gentle breeze! Think I'm going to risk Frocester. The winds are still SSW which may mean it's a little bumpy but i'm up for the challenge! XC is claiming 15mph. That's going to feel quite strong up there! If the wind goes less than 215 degrees at Frocester hill you can get into trouble. The wind comes over the trees right on top of a model. 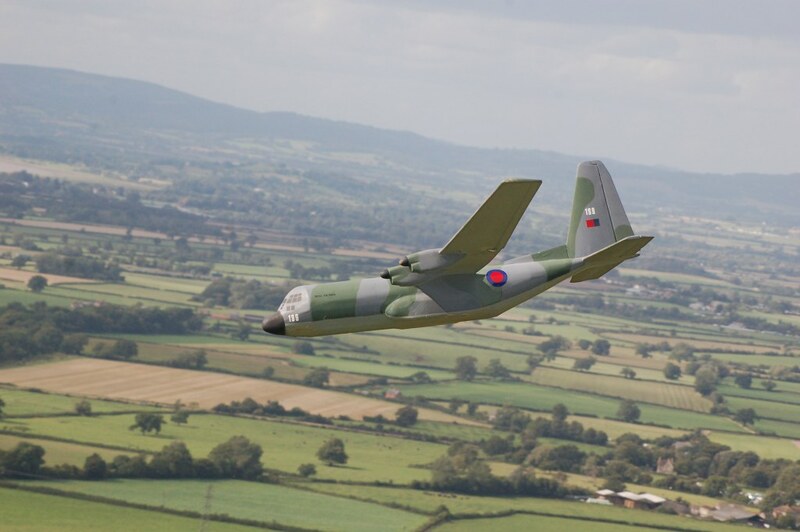 It is much safer to fly at Haresfield on the small slope, a two metre model can be landed if fitted with brakes. Flown at Frocester today, eck it was turbulant. Then went to Haresfeild just as it started raining, did'nt bother to hang about. I popped up to Frocester around 13:30 but didn't even get out of the car. Awesome seeing the rain coming in from that vantage point with such intensity. I was waiting for the lightning to strike the car at any moment! Not looking too promising right now but i am still keen so may venture up there again in a while. Thanks matey. Just finishing off here then heading up to the bowl for a quick blast (weather permitting)! And how was it? Wild, I expect....Haresfield seems to be the windiest place in Glos. A tad gusty. Had approximately 30 mins there before the weather closed in yet again. Thanks for the advice though - it was on slope. I'm away for a the next couple of days but am really hopefull that Fridays W / WNW come into play and Selsley is do-able. We've been moved to our own slot. Seems a good idea to me as it didn't fit too well with all the gliding technical bits! The compass needs updating, there is no overlap between some slopes and Cam Long Down is missing. we first need to measure the limits of the wind direction for each slope, before redrawing. Anyting we can do to help? Don't know who created the original compass but i do like it's simplistic style which makes it very easy to read. Isn't there some software that this was drawn with? There crossed! Will hopefully get a chance to try each day after work and all day Saturday (pink pass from the girlfriend permitting)! It was drawn then scanned, any drawing package will do like Coral, but we need to measure the wind directions first. It's looking like Haresfield again for Sunday. Page created in 0.953 seconds with 83 queries.